A DERELICT play park has been given a new lease of life in the village of Temple Herdewyke. 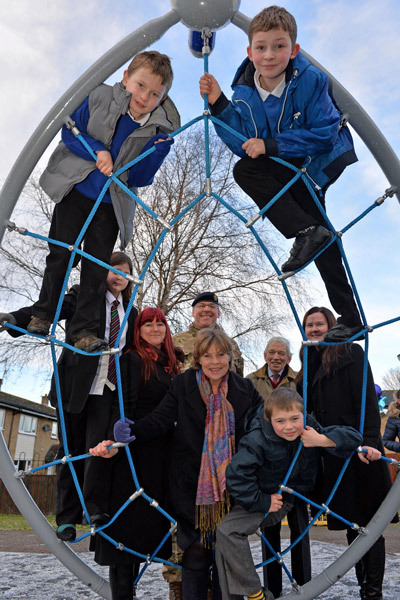 The play park, close to the Defence Munitions base at Kineton, Warks, has been given a complete makeover thanks to a community partnership project between military and civilian communities in the area. Used by military and civilian families, the remodelled park was made possible by a community collaboration between residents, the local Army Welfare organisation, Warwickshire County Council and funding of £60,000 from the West Midlands Armed Forces Community Covenant scheme and £15,000 from bomb-disposal charity The Felix Fund. Welcoming the project, Minister for Defence, Personnel, Welfare and Veterans, Anna Soubry MP, said: “[The park is] a great example of the Community Covenant in action, with money being funnelled into projects that benefit the families of our Armed Forces. Addressing parents and children from Temple Herdewyke primary school, as she cut the ribbon to officially open the project, Cllr Izzi Seccombe, leader of Warwickshire County Council and former chair of the Armed Forces Community Covenant Partnership, said: “We are committed to helping military families in their communities and it gives me great pleasure to open this wonderful play park, which will be enjoyed by all. And parents Corporal Graeme Costine, who works at Defence Munitions Kineton, and his wife Claire said the new play park would provide hours of fun and recreation for their own family, adding: “The new community play park will provide a safe and stimulating environment for our three children. “We really like the fact that it can be enjoyed by both military and civilian families, giving us the opportunity to meet new people.